Ferry-tale: Could a Chicago-to-Michigan Ferry Return from Extinction? 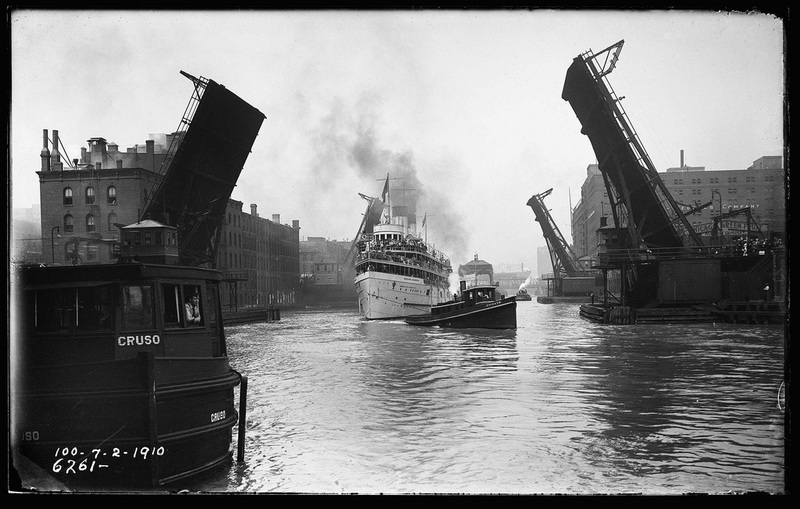 The excursion boat Theodore Roosevelt heads east under the State Street bridge in 1910. 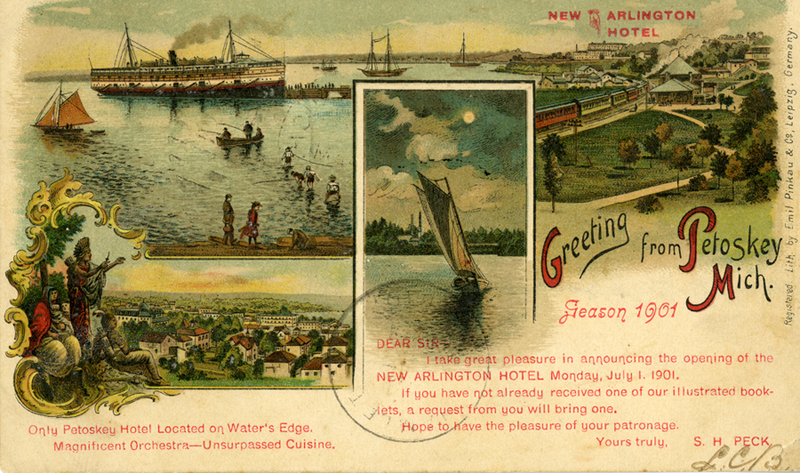 A postcard from the New Arlington Hotel, in Petoskey, Michigan, where many Chicagoans flocked in the summer months to escape the summer heat and histamines. 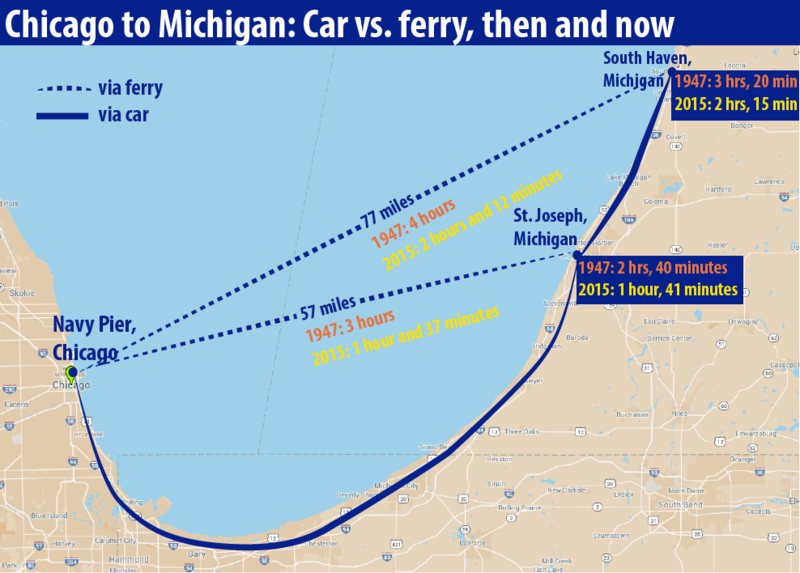 This map depicts 1947 and 2015 travel times from Chicago to St. Joseph and South Haven, Michigan, via ferry and car travel. For details on data and sources, click on image. 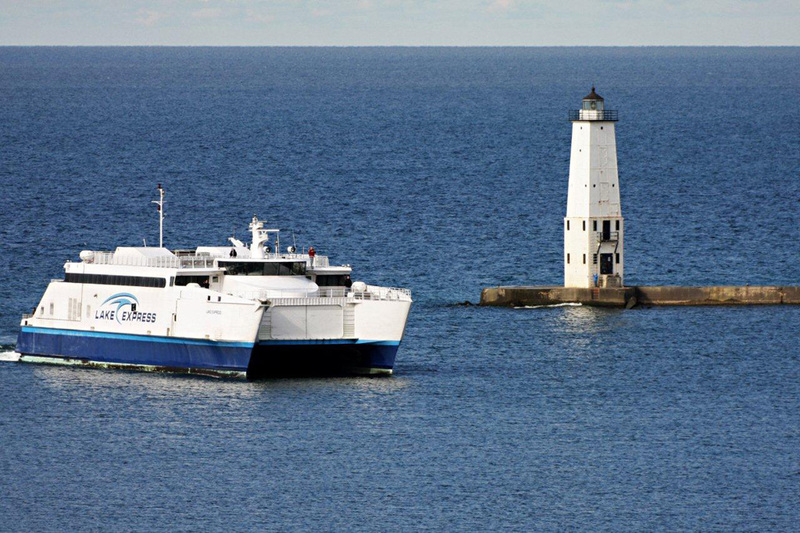 The Lake Express is a high-speed ferry from Milwaukee, Wisconsin to Muskegon, Michigan. President and founder Ken Szallai says the business is feasible from Milwaukee, but would compete too much with the Interstate if he opened up shop in Chicago. 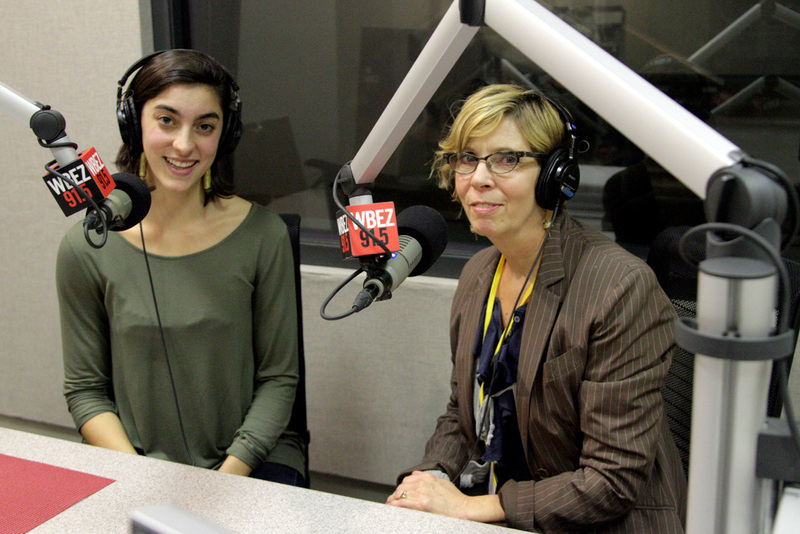 Reporter Chloe Prasinos and questioner Barbara Laing at WBEZ. Barbara Laing is a vibrant, five-cups-of-coffee-a-day kind of person. And that caffeine does not go to waste; Barbara owns and operates a small photography and framing shop in Chicago’s West Andersonville neighborhood, and she has to hustle to keep all the balls in the air. Has there ever been a ferry between Chicago and Michigan, and why isn&apos;t there one now? Barbara has always had a certain reverence for Lake Michigan (“It&apos;s kind of poetic to be out on the water,” she says), but even if you don’t share her feelings, you’ve probably been stuck in a horrible car trip at some point and can relate to rooting for an alternative. So could a lake ferry be that alternative — a waterborne savior, if you will? Are your finger’s crossed? Turns out, there was an alternative! It’s just that, at the time, people called them steamers, not ferries. In the mid-19th century, back before cars or trucks paved roads, the Great Lakes were the region’s superhighways. Grand steamships darted from harbor to harbor, making money by moving products and people. Ted Karamanski, a public historian at Loyola University, emphasizes that both revenue streams were vital to the profitability of the steamship industry. “These were steamships that carried excursionists out for a day of fun on Lake Michigan, or they would carry light manufacturing goods and then, of course … fresh fruit from Southwest Michigan to the Chicago produce markets,” he says. In the 1880’s, passenger traffic was thriving. There were two different kinds of tourists on the lake: the daytrippers and the overnighters. Daytrippers went from “Chicago to Michigan City, or Chicago to St. Joseph, relatively short three, four, five hour trips” across the lake, says Karamanski. St. Joseph, Michigan, even became known as Chicago’s Coney Island. People would picnic and lounge and splash about and then jump on the boat at 5:00 p.m. and be back in Chicago by nightfall. The overnighters took 12-hour trips up to Northwest Michigan, bringing tourists to destinations like Grand Traverse Bay, Little Traverse Bay, even some to Mackinac Island for longer stays, Karamanski says. These were usually wealthy travelers who could afford to spend weeks or even months away from the city. “They would usually be organized by different religious denominations,” Karamanski explains. “So the Methodists would have a club where people could go, and the Presbyterians would be in another place, the Baptists somewhere else.” That way, husbands who stayed in the city for the summer to work could rest assured that their wives and children were escaping the heat and histamines in a safe, morally righteous place. Over time the small tent colonies developed into clusters of cottages, and eventually those cottages became enormous Victorian manors. There was an opera house and dance halls and tea rooms — you name it. “People might be surprised to know that there were so many well-known names that visited here,” Garver says. “In fact, I&apos;m surprised when I go through records and see ... ‘Oh yes, Amelia Earhart, she came here and spoke here.’” Mark Twain gave a lecture, and Ernest Hemingway wiled away his childhood summers at his family’s cottage. The list goes on. And sometimes, the boats were just plain unsafe. Like the S.S. Eastland. You may have heard about this: On July 24, 1915, about 2,500 people boarded the Eastland for Western Electric Company’s annual employee picnic when the boat tipped into the murky Chicago River. And, over time, it only got worse. During the 1950s, the interstate highway system began to zigzag across the nation. As infrastructure improved, more and more people abandoned lake ferries in favor of their cars. There were consequences for people and communities on both sides of the lake. Karamanski believes Chicagoans lost a historic, intimate connection to the lake, which had helped the city develop in the first place. On the Michigan side of the equation, Garver says that the highways drastically changed the face of Petoskey. Back in the day, “when travelers arrived by steamship or by train here ... they had their choice of 15 different luxury hotels,” all centrally located in the heart of downtown. Since the age of the automobile, all but one of the those 15 hotels either went out of business or burned down and was never rebuilt. Today, plenty of hotels dot the interstate on the way into town, hoping to be the first place you see well before you reach Petoskey’s historic city center. But these days, in bad traffic, that same trip might take closer to three hours. Which leads one to wonder: Could ferries make a comeback? Is there a case to be made for a Chicago lake ferry revival? Remember: Questioner Barbara Laing’s interest in the history of lake ferries is not simply nostalgic. She’s a business woman and she knows a money-making opportunity when she sees one. After all, there are two ferries that operate on the lake today. Lake Express runs from Milwaukee, Wisconsin, to Muskegon, Michigan. The S.S. Badger operates between Manitowoc, Wisconsin and Ludington, Michigan. It stands to reason that Chicago, with its lakeside location and enormous metropolitan population, brimming with potential customers, could have a modern ferry service, too. Szallai explains that a Chicago ferry would compete with the interstate and Amtrak’s Pere Marquette line. Milwaukee’s ferry doesn’t have that problem; the Lake Express’ route is a straight shot across the water, which helps customers cut out hundreds of miles of travel around the lake. Szallai says when you factor in the fierce competition, plus operating expenses and the short operating season thanks to the region’s fierce winter … Well, he’s not going to invest in a Chicago ferry anytime soon. Why was it infamous, you might be wondering? “Well, because it never made it into the water,” Callaghan retorts. After awhile, it became clear to Callaghan that the proposal was dead in the water and LEF Corp disbanded. Who knows? If maritime technology improves and ferries get faster while Chicago-area traffic gets worse, and global warming heats up the planet and eliminates our icy winters, maybe, just maybe, someone will revive a Chicago-Michigan ferry. Chloe Prasinos is an independent reporter and producer based in Chicago. Follow her @chloeprasinos. Ferry travel times for 1947 were calculated with an average speed of 19 mph and based on the routes depicted in a related infographic from Chicago Tribune archives. Ferry travel times for 2015 were calculated with an average speed of 35 mph and informed by our interview with Ken Szallai, president and founder of the Lake Express ferry in Milwaukee, Wisconsin. Car travel routes from Chicago (Navy Pier) to St. Joseph and South Haven, Michigan, depict general directions, not exact directions over specific streets, highways and interstates. The 1947 route includes US 41 and Red Arrow Highway, with an average speed of 45 mph established in consultation with Joseph Schwieterman of DePaul University’s Chaddick Institute for Metropolitan Development. The 2015 car travel time was suggested by Google Maps with a route via I-90/94. Correction: An earlier version of this story misstated the timeframe during which the U.S. Interstate Highway System affected transportation options and habits. The correct decade for delineating the start of that program is the 1950s.